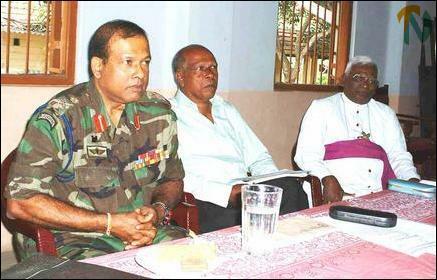 The PCPG met the Sri Lankan security forces commander for Jaffna, Maj. Gen. Susil Chandrapala, Maj. Gen. T. T. R Silva and the Senior Superintendent of Police for Jaffna Mr. Harold Anthony at the Bishop’s House in the northern town Wednesday for discussions on measures for restoring of normalcy in the northern district. The military told the PCPG delegation when it took up the problems faced by fishermen in the peninsula that army pass system for fishing cannot be removed and that fishermen cannot return to shore at night. 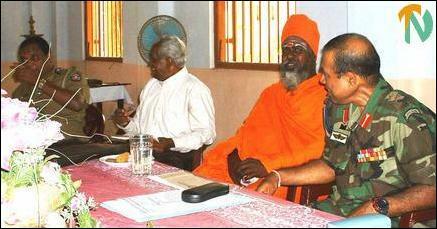 The PCPG quoted the Sri Lankan security forces officers as saying: ‘we want the people of Jaffna to have trust in us. We will take action if any wrong perpetrated by members of the Sri Lankan security forces in Jaffna is reported to us’. 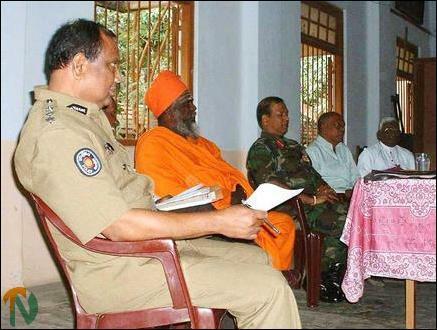 The PCPG delegation urged the Sri Lankan security forces (SLF) officers to open the Kerathivu-Sangupiddy cause linking Jaffna with the western sector of the mainland Vanni. The SLF brass told them that they would take the matter into consideration and give their response at the next meeting. The military also told the PCPG that the checking of students, teachers and others going to the Tellipalai Union College and Mahajana College cannot be stopped.